Actress Lucy Liu is probably best known for her roles in Kill Bill, Charlies Angels, Chicago, and Allie McBeal. However, she is also an artist. 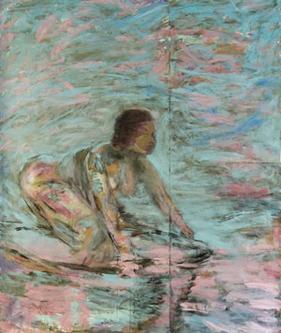 The image shown here is "Roxy" by Lucy Liu. It was one of the pieces in her September 2006 "Glass Onion" exhibition at the Milk Gallery in New York City. Following the exhibition, Lucy's original artworks were then sold at auction, raising more than $267,000 to benefit UNICEF. Lucy Liu is a UNICEF Celebrity Ambassador. She was appointed U.S. Fund for UNICEF Ambassador in 2005. She supports UNICEF's HIV/AIDS awareness and education programs. Visit the UNICEF website for more information about Lucy Liu's work as an Ambassador.